Take a holiday in Egypt, far from hectic Cairo and the crowds that head to the temples of the Nile Valley to discover a secret corner of the country that few ever see, on this escape to Lake Nasser. Tucked away in the desert wilderness of ancient Nubia in the south of Egypt, Lake Nasser is a huge body of water, with a coastline that exceeds 7,800km. It’s a beautiful and completely unspoiled place, which barely a single tourist discovers, and it’s home to Nile crocodiles, huge temples and more than 100 species of birds. This fabulous nine day tour takes you to the heart of this little visited and peaceful region, travelling on a small safari boat. You will have the chance to sleep under the open sky each night and each day we will leave the boat to explore – climbing huge desert dunes, swimming in pristine waters full of Nile perch and tiger fish, exploring Pharaonic temples and seeing prehistoric graffiti. 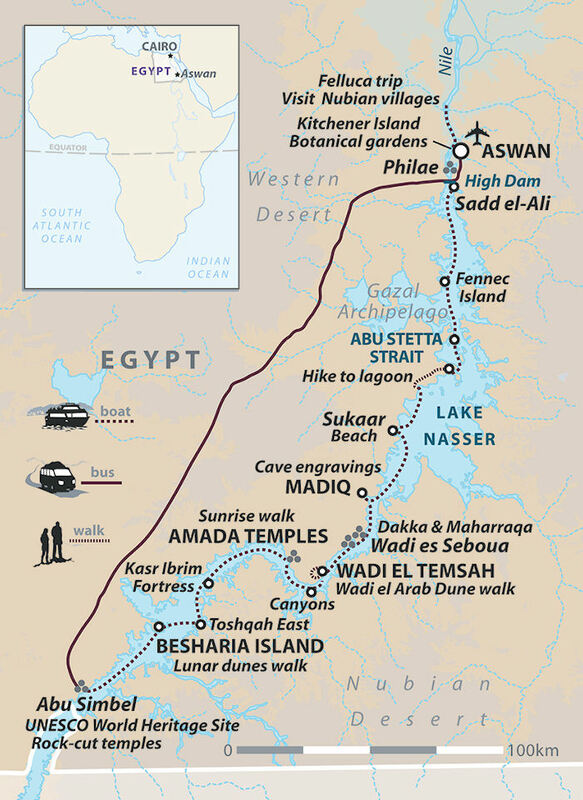 You will have time to explore Aswan, too, a bustling, culturally diverse city, and will visit the huge rock temples of Abu Simbel, a World Heritage Site. This is the Egypt few people see, both beautiful and full of culture and history. With such a rich history, the southern stretches of the Nile has long attracted travellers, and whilst the antiquities are available for all to enjoy, the way that we visit can make a huge difference, ensuring that generations to come can share this privilege. This trip travellers by Dahabia – a traditional type of small boat that carries a maximum of 18 people. This allows us to lead river cruising with controlled sanitary drainage disposal (which takes place in the assigned harbors) and prevents its discharge to the River Nile, thus avoiding the pollution generated by larger cruise liners. In addition, when you take one of our trips, we make a contribution to “Carbon Clear” – an organisation devoted to ‘offsetting’ or ‘neutralising’ harmful greenhouse gas emissions such as those caused by your flight. They work with hundreds of organisations to measure their carbon footprint, in an effort to then reduce their carbon emissions. This is done by funding projects across the world that will reduce greenhouse gases on your behalf such as through sustainable energy or rainforest restoration. In addition to the environmental advantages, the Dahabia program has helped us create a stable relation between environmental tourism and the understanding of sustainable development. By involving local villages and visiting human settlements on the banks of the river, we aim to draw tourism away from the main sites of Luxor and Aswan, and to support the socially and economically underdeveloped parts of Egypt. Travelers have the chance to cross beyond the regular travel programs to Egypt and understand more about the country and the people, ensuring that funds are channelled into local communities. We use local guides, staff, lodges, and buy food locally, thereby directly benefiting the local economy.